There has been quite a bit of coverage of Georgia’s recent resolution marking April as Confederate Heritage and History Month. What has gone largely unnoticed, however, are the changes that have been made between the initial proposal and the final version. To amend Chapter 4 of Title 1 of the Official Code of Georgia Annotated, relating to holidays and observances, so as to create Confederate Heritage and History Month; to provide for legislative findings; to encourage observances and celebrations of Confederate Heritage and History Month; to provide for statutory construction; to provide for related matters; to repeal conflicting laws; and for other purposes. To amend Chapter 4 of Title 1 of the Official Code of Georgia Annotated, relating to holidays and observances, so as to create Confederate Heritage and History Month; to provide for legislative findings; to encourage observances and celebrations of Confederate Heritage and History Month; to provide for statutory construction; to amend Article 3 of Chapter 3 of Title 50, relating to other state symbols, so as to provide that the Ralph Mark Gilbert Civil Rights Museum shall be an official state historical civil rights museum; to provide for related matters; to repeal conflicting laws; and for other purposes. Looks like someone wants to piggyback their pet project on the Confederate History Month bill there in GA. Nothing like Politics. Well, of course it is. Anytime the government steps into the realm of historic commemoration one must interpret it as a political act. The only difference, compared to just a few decades ago, is that our elected officials now represent a wider segment of the population. This couldn’t happen at the turn of the twentieth century because African Americans were not allowed to vote. So, because of the clause “to repeal conflicting laws,” did the bill, as passed repeal itself? 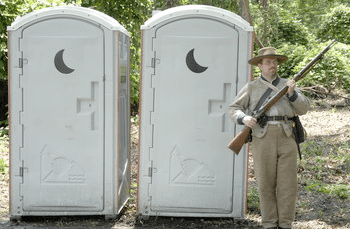 Great photo of a Confederate soldier guarding the porta-potties. For some reason that image was included in a news item on the subject. I thought it was kind of interesting.